The situation in Libya is sharpening, General Haftar is still on the rise to the capital Tripoli and international appeals remain unheard. The international community is increasing its pressure on Libyan General Khalifa Haftar. The G-7 countries were very concerned about the situation in the North African country on Saturday at a meeting of Foreign Ministers. Germany, France, and Italy have urged the breakaway Libyan General Khalifa Haftar on Saturday to stop his offensive on the capital Tripoli. “There will be no military victory in Libya, and the solution can only be a political one,” said French Foreign Minister Jean-Yves Le Drian at the end of the G-7 Foreign Ministers meeting in Dinard. German Foreign Minister Heiko Maas stressed that a further military escalation had to be prevented. Italy’s Foreign Minister Enzo Moavero Milanesi said: “No one is prepared to accept a militarily created fact.” The G-7 foreign ministers agree on the issue of Libya. They had called on Friday evening in the French Dinard, the conflict parties should “all activities and all troop movements on Tripoli” immediately end. The UN Security Council had called on Haftar and his self-proclaimed Libyan National Army (LNA) on Friday to stop all military movements. The appeals were initially unheard. Eyewitnesses reported battles south of Tripoli on Saturday. Haftar’s opponents apparently tried to cut off their supply routes. It was unclear at first whether the supporters of the General could take them since 2014 idle international airport in the south of Tripoli. Meanwhile, Haftar’s troops reported that they had been attacked from the air about 50 kilometers from Tripoli during their advance. 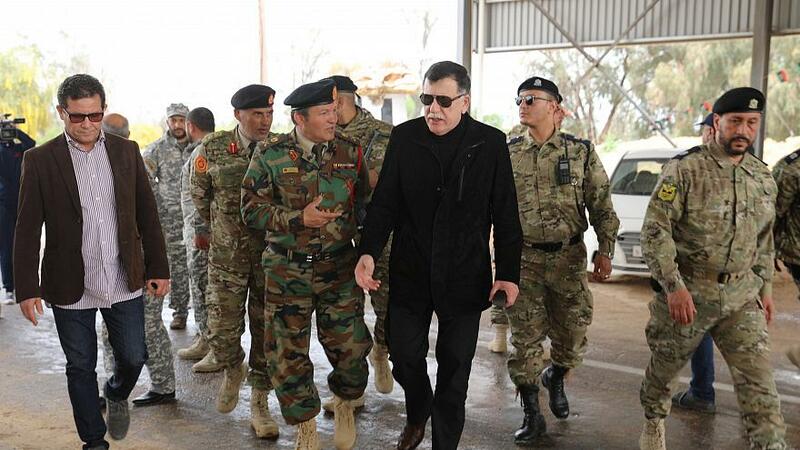 Haftar had given his troops on Thursday the order to advance to Tripoli, where the internationally recognized government of Fayez al-Sarraj sits. The 75-year-old general wants to take over the capital and unite the oil-rich country under his leadership. However, he has to expect strong resistance in Tripoli, which is why observers fear a new civil war. Since the overthrow of the ruler Muammar al-Gaddafi in 2011, there is chaos in Libya. Haftar has become the most influential figure in Libya in recent years. He enjoys the reputation of a military for whom politics comes second. An all-party conference scheduled for mid-April on the future of the country should set dates for the parliamentary and presidential elections. The conference is scheduled to take place despite the current escalation.